When the TV series Community was renewed for a season four, geeks and nerds banded together with glee. But when Sony (the company that makes Community) decided to fire Community creator and showrunner Dan Harmon, the same geeks and nerds didn’t want to see a watered-down version of their beloved show. The gang from Greendale Community College returns to NBC this fall whether you like it or not. NBC’s quirky sitcom Community has some pretty strong geek leanings. Community‘s Doctor Who-inspired Inspector Spacetime show-within-a-show has played an increasingly large role in the show over the last season, and things are about to take another turn for the geeky. Battlestar Gallactica’s hottest Cylon, Tricia Helfer, is joining the embattled show for a guest spot in the upcoming fourth season. “Six seasons and a movie.” It’s become the rallying cry for fans of NBC’s Community, a brilliant and hilarious show that has never snagged the ratings that it truly deserves (such are the perils of aspiring for programming more intelligent than, say, Two and a Half Men). That idea is most likely wishful thinking, but assuming it’s not the stuff of pipes, what would a Community movie look like? I don’t have any idea. Do you? One artistic Community fan thinks it should look a little something like this. There was more than a little head-scratching when NBC’s brilliant but under-watched sitcom Community was nominated for a Hugo earlier this year. Others can argue whether the episode in question, “Remedial Chaos Theory” – which played around with the concept of divergent timelines – should count as science fiction or not. What is beyond debate, however, is that Community‘s writers have shown plenty of love for both science fiction and its fandom. The show has even created its own meta mythology that includes horrible sci-fi movies (Kickpuncher) and a Bizarro version of Doctor Who called Inspector Spacetime: a bowler-hatted adventurer who travels through time and space inside a phone box. 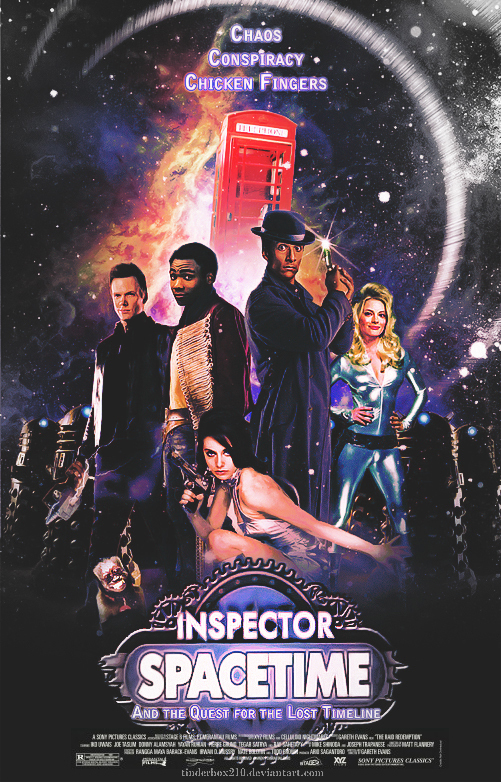 And according to one of the show’s producers at Comic-Con last week, Community will be taking us even further down the Inspector Spacetime rabbit hole next season with an episode set inside an Inspector Spacetime convention.